A Queensland prison has won a prestigious international award for a program to eradicate Hepatitis C amongst prisoners. This Australian first is helping to improve the health and wellbeing of the general prisoner population and also of remote Aboriginal and Torres Strait Islander communities in Far Northern Queensland. 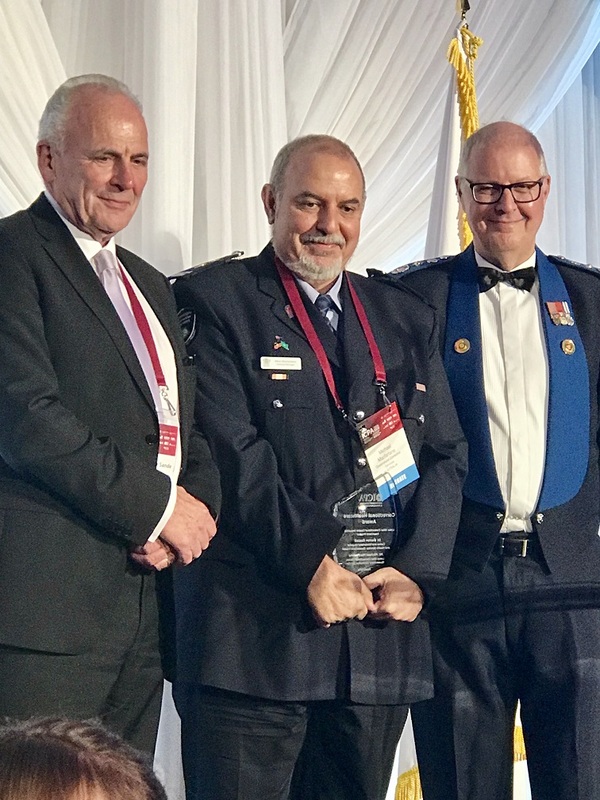 The joint Queensland Corrective Services and Queensland Health project received the Correctional Healthcare Award at the International Corrections and Prisons Association Awards in Montreal, Canada. The Lotus Glen Correctional Centre Hepatitis C eradication program has led to the prison, which is based near Mareeba on the Atherton Tablelands, being the first prison in Australia to achieve near-eradication of the potentially deadly disease. Queensland Corrective Services Commissioner Peter Martin said the project had wide ranging benefits to staff, prisoner and wider community safety. “The catchment area for Lotus Glen includes Cairns and a large number of remote Aboriginal and Torres Strait Islander communities in Far North Queensland,” Commissioner Martin said. “Prisons are recognised worldwide as potential incubators for blood-borne viruses which present real risks to staff, other prisoners, and to the community on the prisoner’s release. L-R: ICPA President, Mr Peter van der Sande; Lotus Glen Correctional Centre General Manager Mr Michael Macfarlane; and ICPA Board Member, Mr Peter Severin. Commissioner Martin said the project team in Cairns was excited to be a part of the Australia first, made possible by the introduction of new medication to effectively treat Hep C.
“Left untreated, Hepatitis C can lead to liver damage and failure,” he said. “It is spread easily through sharing needles and exposure to blood containing the virus. “That’s why this project is so significant from a public health perspective. “Cairns and Hinterland Hospital and Health Service (CHHHS) staff and Hepatitis Queensland did an excellent job in educating prisoners about the disease, encouraging them to get screened, and managing their treatment. The significance of the project was recognised by the International Corrections and Prisons Association, the peak industry body for corrections worldwide.